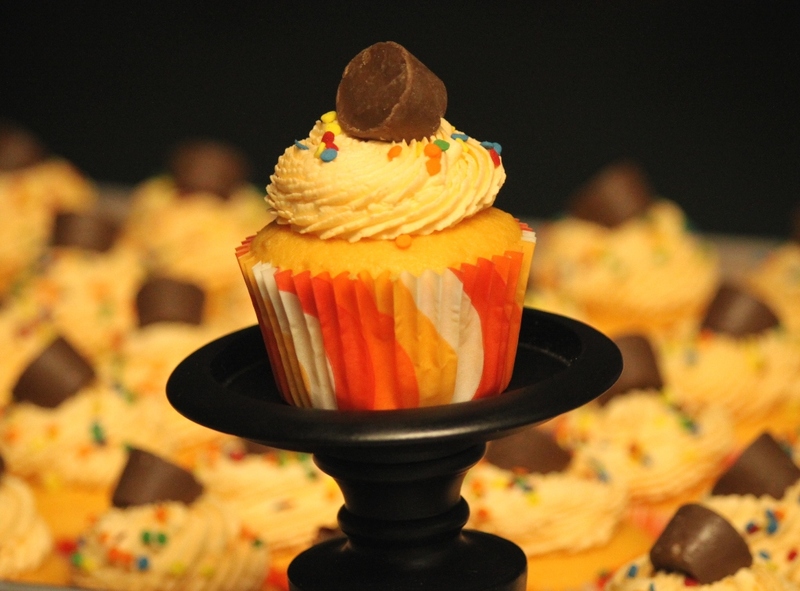 Orange Rolo Cupcakes with Easy Buttercream Icing | Rosetta Bakes! Okay, okay, okay, so I cheated on this cupcake because I was in a hurry and wanted to bake something quick to take to work. I am a fan of Duncun Hines cake mixes when I need to make something quick. I used Duncun Hines Orange Cake mix and added grated orange peel. The icing I made scratch, and the Rolo candies I unwrapped! 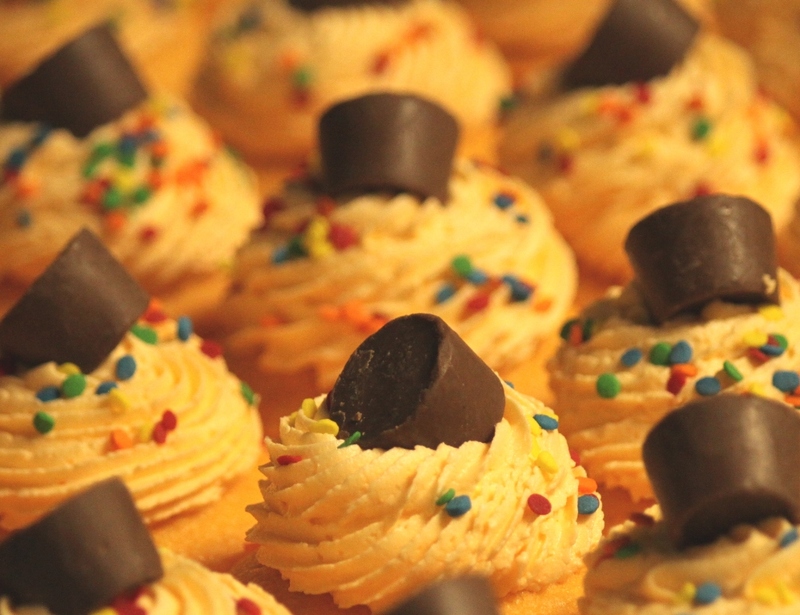 Place a frozen Rolo in the bottom of each cupcake paper. Pour cake batter over frozen Rolo (2/3 full). Bake at 350 for 18 minutes or until a toothpick inserted comes out clean. Allow to cool and then ice with icing recipe below. Top each cupcake with a Rolo on top of icing, then decorate. Make sure you put sprinkles on before icing dries. Cream butter and vanilla until smooth. Add in vanilla and orange extract. Add confectioner sugar gradually and slowly add in cream. Make sure you whip the icing well as it gets creamier when you mix it longer. The amount of cream you add depends on how thick or how thin you like your icing. I added 3 Teaspoons (1 Tablespoon). 3. In a bowl beat together cake and pudding mixes, sour cream, oil, beaten eggs, water and vanilla until smooth. 4. Evenly divide batter among pans. 5. Gently push a frozen Rolo in the center of batter and smooth the surface to cover candy. 6. Bake 18 to 22 minutes or till top is springy to touch. A small divot may appear in the center of cupcakes, do not worry, icing will cover it. 7. Cool Throughly on wire racks. Cream butter in bowl and add vanilla, salt and caramel, combine well. Begin adding powdered sugar, mix well after each addition. After all is added, mix throughly-give it a taste to see if you need more caramel. For a thicker frosting, you can add more powdered sugar. In a small saucepan (medium heat) warm the heavy cream till scalded (not boiling). Place chocolate pieces in a heat safe bowl. Pour hot cream over chocolate and allow to sit for 5 minutes. Whisk the cream and chocolate till smooth, whisk in honey, corn syrup and vanilla. Allow to cool (15 minutes only). Spoon glaze on top of frosted cupcakes-let drip down sides a bit. Don’t add too much. Top with a Rolo (stored in fridge), you can remove 1 hour before serving.